Branson, MO - It was just six seasons ago that Abby Coates began playing basketball competitively in the 8th Grade at Metamora Grade School. Fast forward to July 2018, and she's preparing to depart for Atlanta, Georgia to participate in the 2018 JUCO Top 40 event, which features the top 40 players at the NJCAA level across all three divisions. The All-Star game will take play at Georgia State University July 27th-29th. Games like these tend to draw some big-name colleges, and that is definitely the case for this one. Oklahoma State (Big 12), Mizzou (SEC), Virginia Tech (ACC), Utah (Pac-12), Xavier (Big East), Clemson (ACC), Butler (Big East), Seton Hall (Big East), LSU (SEC), Auburn (SEC), and Ole Miss (SEC) are the "Power Five" conference representatives at the games. It may seem a bit stressful to see that many big colleges, and Coates acknowledged that. "It's definitely going to be nerve wracking, but also very exciting. This is a once in a lifetime experience, so I am feeling very blessed that I have this opportunity." An all-star type of game presents a unique atmosphere on its own, and the Metamora alum says there's just one thing you're able to do. "The only thing you can really do is play a lot of basketball." Coates added that she's been going to open gyms both at ICC and Metamora High, saying she uses those for her own personal practice time. The 5'11" sophomore comes from a program that has won three regional championships all-time, so historically, the postseason success has been limited. Coates participating in the JUCO Top 40 could put a big light on the program, and maybe even pave the way for more players of this quality, something that she says is just as good of an opportunity as being in the game itself. "It feels awesome that I can represent Metamora in such a good light!" Coates even went on to say that she hopes that "other players learn that they can accomplish so many things if they work hard and put their mind to it!". All this being said, it's still almost surreal for Coates. "If you would have asked me freshman year if I would be playing college basketball, I would have said there is no way." The Top 40 is not the only honor that Coates received in the 2017-18 season. She was named to the NJCAA DII National Tournament All-Tourney Team in Harrison, Arkansas. She finished the 2017-18 season with numerous impressive stats, the one that sticks out the most being that Coates was part of a three-way tie for 26th in blocks in the entire country within Division II. 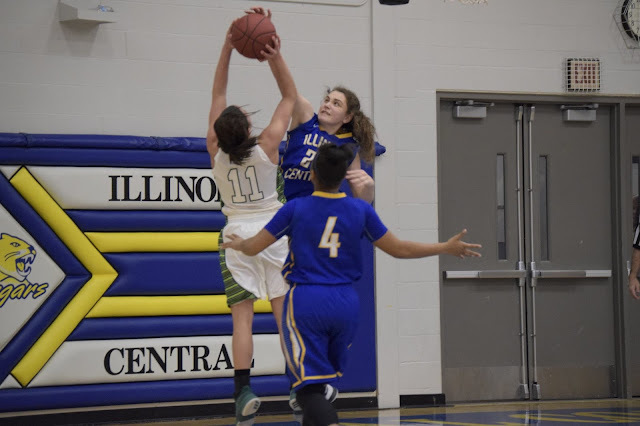 Equally as impressive, she was ranked in the top five on the ICC team in field goals made (134 - 2nd), free throws made (61 - 3rd), scoring (329 points - 3rd), rebounds (249 - 1st), steals (61 - 1st), and blocks (47 - 1st). 2018-19 could be an even bigger season for Coates, and that leaves many exciting unanswered questions. The last ICC player to get named to this event was Destiny Ramsey, a two-time NJCAA All-American while with the Cougars, who just wrapped up her senior season at Illinois-Springfield in 17-18. Fans that want more information on the JUCO Top 40 event can follow @2Top40 on Twitter. The schedule begins with open practices on Friday, the 27th of July, and games begin on the 28th and continue on the 29th, all taking place at Georgia State University.